Star clusters and their stellar populations represent a backbone of modern astrophysics, with a strong impact on our understanding of key open issues, from the star formation and evolution, to the assembly and evolution of the Milky Way, and of the galaxies in general. The proposed workshop will focus on clusters in a relatively old evolutionary stage, where signatures of the initial formation are erased by dynamical evolution. They are fundamental to constrain the models of the building blocks of the stellar populations in galaxies, together with globulars which are the natural complement at lower metallicity and older ages. 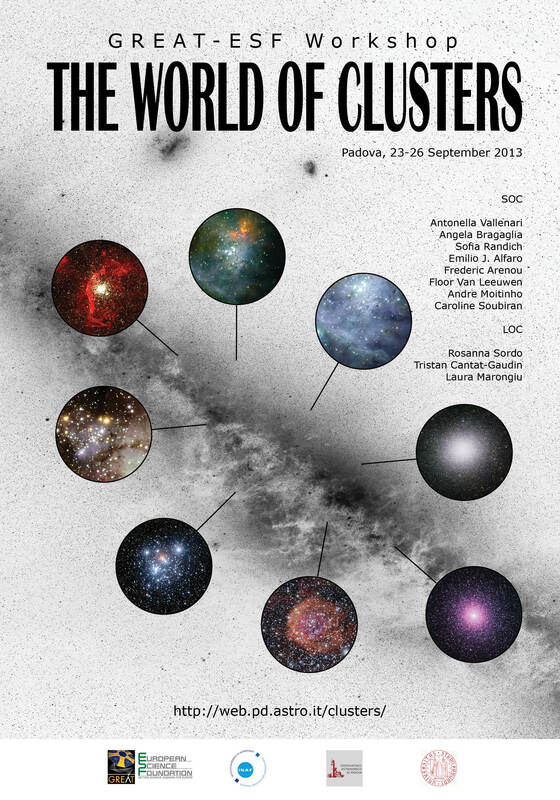 We will discuss the properties of cluster stellar populations focusing on similarities and differences among objects formed in our and in external galaxies. In the next few years the cornerstone ESA Gaia mission will revolutionize the domain of Milky Way research. Gaia will be complemented by on-going or proposed large-scale photometric and spectroscopic surveys, both in the visible and in the infrared (Gaia-ESO Survey, VPHAS+, UKIDSS, VVV VISTA, APOGEE ) improving the census of clusters and cluster members at the low mass end and at larger distances from the cluster center, significantly contributing to cluster astrophysics. For the first time, memberships, proper motions, distances from Gaia, metallicity, and ages from ground-based surveys can be homogeneously derived for a large number of clusters. Clusters in Gaia will still provide a wealth of insight into galaxy evolution: their ages, distances, and metallicities as derived from Gaia data will allow us to put well defined probe-points all over the optically visible Galaxy, well beyond the volume where individual stars can be used. Gaia good binary detection capability will allow mass determinations from new orbits. These high quality data will allow gathering a better understanding of the formation and evolution of the individual clusters, and of the evolution of the stars in the clusters. When coupled with information about field stars, they will develop a single narrative of the formation of galaxies such as the Milky Way.